After establishing a strong hold in the premium mining tipper segment, Volvo Trucks has turned its attention to construction trucks. Much water has flown under the bridge after Volvo Trucks entered India in 1996. 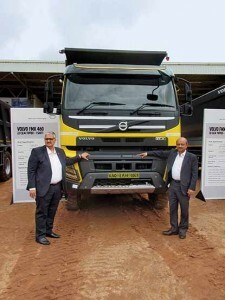 Continuing to operate in the premium trucking segment in India — claimed to account for three to four per cent of the total market in India, Volvo Trucks has come to enjoy a strong hold in the premium heavy mining tipper segment. With the truck market estimated to be 500,000 units per year, Volvo Trucks, offering innovative solutions like 10×4 dump trucks to help mining contractors to tackle rising pressures on margins, is looking at construction trucks. With almost 90 per cent of its market share coming from the mining segment, Volvo Trucks has majority of its resources in India aimed at the mining segment. With the infra sector in India showing signs of accelerating amid government announcement to invest historically high sums, Volvo Trucks’ attention to construction trucks could not have come at a better time. With India over the next three years expected to spend up to Rs.25 trillion towards power generation and distribution, roads and urban infra projects, the Swedish major is looking at good growth. While 70 per cent of the Rs.25 trillion is expected to drive the above mentioned developments, 20 per cent of the sum will go into the development of 27 industrial clusters. A sum of Rupees-five trillion is earmarked for the development of rail and port connectivity. Considering such developments, Volvo Trucks could leverage its experience in providing trucking solutions to this segment in numerous other markets the world over. 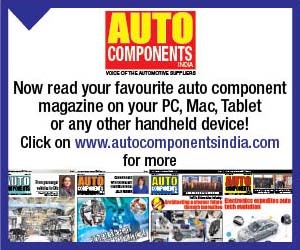 Drawing attention to progressive government economic policies like GST, Dinakar B, Senior Vice President – Sales, Marketing & Aftermarket, Volvo Trucks India, expressed that infra segment players are confident of the segment booming. “We are thus keen to leverage the segment growth to our advantage by offering the players the best solutions,” he mentioned. 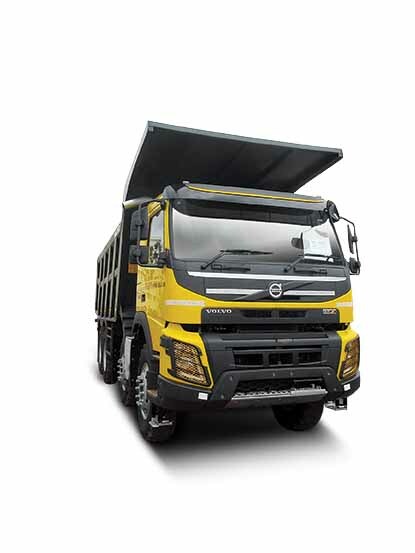 Commanding a 65 per cent market share in the coal mining truck segment, Volvo Trucks is eyeing a plethora of infra and construction activities to make inroads. From big irrigation projects, airports, metros to road construction, the company has a range of solutions to offer. Based on the FMX and FM range of heavy trucks, the solutions include BSIV Volvo FMX 460 with 22 cu. m. body, BSIV FMX 460 with 33 cu. m. body, BSIV FM 440 prime mover with tip trailer superstructure, and FM 460 6×4 puller. The company is also looking at offering a FM 420 prime mover model once it is homologated. 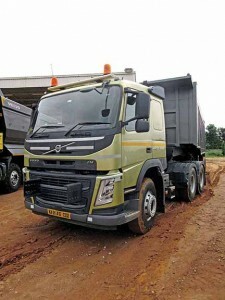 Aimed at infra players that are keen to elevate their efficiency and competitiveness, given the tight time schedules they work with, Volvo Trucks, according to Vinod Aggarwal, MD and CEO, Volvo Eicher Commercial Vehicles, will take a systematic approach to gain a strong foot hold in the infra and construction segments. “We have identified the areas that can bring us growth. The way we brought productivity to mining customers, we will bring productivity to the infra customers as well,” he said. To operate at the premium end of the infra and construction truck segments, Volvo Trucks will offer higher return on investments. The focus, it looks like, will be to help infra and construction segment contractors to further elevate productivity and efficiency. Informed Dinakar, “We will support our customers to achieve higher operational efficiency, and to execute projects on or before time.” Averred Aggarwal, “Volvo Trucks can play an important role in providing end-to-end solutions to its customers.” He drew attention to good monsoon and initiatives like the linking of rivers. Large irrigation projects, it is clear, are on Volvo Trucks’ radar. Also, projects like smart cities and border road development, which would need much technical support to complete within the stipulated time frame. Projects like these are expected to prove a good ground for the Swedish major. It could flex its muscles; offer solutions that it has been offering in other parts of the world to help contractors and governments execute ambitious projects. The presence of Volvo Eicher Commercial Vehicles joint venture in the infra and construction segment, albeit at the mass volume level, should help Volvo Trucks to foray into the infra and construction segments. It could leverage Volvo Eicher’s network and tap into the joint venture company’s customer base, providing them an opportunity to upgrade. By keeping the customer in the family, Volvo Eicher, which distributes Volvo Trucks in India, could find its network acquire more business, support premium trucks and look at higher spare and service margins. In what could prove to be a win:win situation for Volvo Trucks, Volvo Eicher and all those involved, the infra and construction segment customers could leverage Volvo trucks to seek the best TCO. Expressed Aggarwal, “Customer success matters most. It is he who should earn more profits. 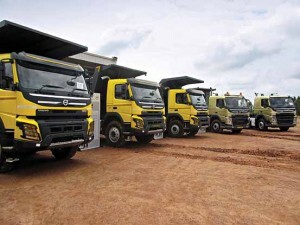 If he is able to recognise our value, only then will we be able to sell our products.” Volvo Trucks has till date sold over 100 units to 10 customers across key construction segment businesses. These include road, marble and granite mining, and irrigation. Five trucks were recently delivered to Pune-based Satav Stone company, which specialises in stone quarrying. The government announcement to replenish pubic sector banks could prove to be just the right development for Volvo Trucks as it forays into the infra and construction segments. Opined Aggarwal, “The economy may not touch seven per cent growth mark this year, the next two years will see it bounce back.” Pointing at the 20 per cent growth the CV industry posted in the second quarter of the current fiscal as against a drop of 25 per cent in the first quarter, Aggarwal said, “What we lost in the first quarter has been majorly recovered. If the GDP grows, the CV industry will grow.” With stress on providing the same technology that Volvo offers in other markets, the construction trucks will be powered by the Volvo 13-litre six-cylinder engine that produces between 420 and 540 hp. I-Shift transmission will be offered as standard. 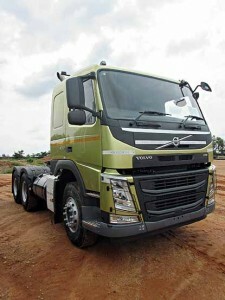 As per the nature of application, Volvo will offer the appropriate variant of I-Shift automated manual transmission. The Pullers, for example, will come with crawler gear equipped version of the I-Shift AMT. According to Dinakar, every Volvo vehicle they sell is with an I-Shift gearbox. “With I-Shift, customers experience better productivity, ease of driving, and better efficiency,” opined Dinakar. He hinted at Volvo Trucks looking at an opportunity to re-enter the long-haul segment as well. Quickly stating that there is still time for Volvo long haul trucks to perform at their peak in India, Dinakar said that infrastructure will have to improve manifold. 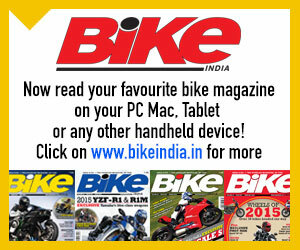 Expressing that trucks will gain a lot of electronics, Dinakar remarked that trucks will travel at higher speeds. Mentioning that the demand for high end trucks will be proportional to high end infrastructure, Dinakar explained that it is only then that the long-haul Volvo trucks will deliver peak performance. 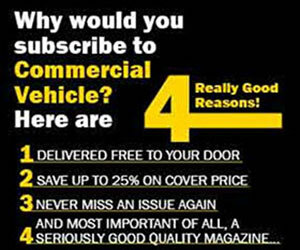 With the selling experience of commercial vehicles far different from that of a passenger vehicle, Volvo Trucks, in association with its joint venture company and distributor Volvo Eicher has come to build a strong rapport with its customers. The company has invested heavily to provide customers on-site workshops and service centers at strategic locations. With a foray into the infra and construction segments, the company is looking to offer similar level of experience and support. 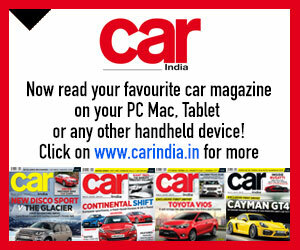 Mentioned Aggarwal, “We will continue to engage with our customers.” Underscoring the importance of such a measure, Aggarwal pointed at initiatives like driver training, which will help the customer to get the most value out of his investment. “The driver has to drive the truck well to extract the best efficiency. Volvo trucks are advanced machines, and to get the most out of them, it is necessary to have a skilled driver, and to adhere to maintenance schedules,” remarked Aggarwal. Priced up to four times higher than basic trucks, Volvo Trucks is finding takers because of its ability to contribute to the timely completion of projects. Often in 24 months against the stipulated time period of 36 months. 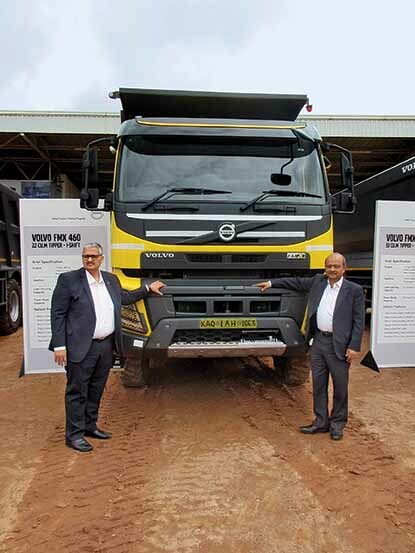 Expected to support infra and construction project contractors to complete their projects on time, Volvo trucks, according to Dinakar, is looking at driving a change. 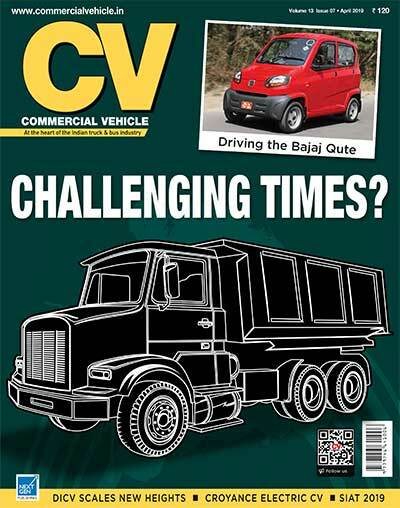 Stressing upon the rapid change taking place in the Indian truck market, including the shift to higher tonnage vehicles, Aggarwal mentioned, “Tractor trailers and multi-axle vehicles will see good numbers. The market for tractor-trailers was 41,000 units last year. This year, it is growing at 45 per cent, and should touch the 55,000 units mark.” Prime mover and puller-based solutions are a part of Volvo’s portfolio for the infra and construction segment. They hold a good chance of creating an industry first when it comes to productivity, efficiency, and the ability to earn. The FM 420 prime mover is one of many solutions Volvo Trucks is offering to the infra and construction segment players in India. It is a 6×4 tractor, and powered by the BSIV Volvo D13 12.8-litre six-cylinder diesel engine that produces 420 hp at 1400-1800 rpm. Peak torque of 2100 Nm is produced at 1050-1400 rpm. Mated to the engine is a 12-speed I-Shift AMT gearbox. Capable of addressing diverse applications like the transportation of earth, stone, granite and marble among others by attaching a trailer, the FM 420 has an impressive 36 per cent grade-ability. Flaunting a solid build and superior fit and finish standards, which reflect upon its premium standing, the clear lens head lamps with daytime running LEDs of the truck contribute towards a premium stance. The large signature grille extends well into the bumper and provides the truck with a distinct identity. Riding on 20-inch dia. wheels, the FM 420 is fitted with a tilt-type four-point suspended sleeper cabin. Capable of long-haul and 24×7 operations, the truck, with a GCW of 49-tonnes, features ABS, Electronically controlled Brake System (EBS), hill start assist, electronic parking brake, auto parking brake release, ESP, hydraulic retarder, cruise control, adjustable driver’s seat, adjustable steering, AC, smart phone integration, and more. Climb aboard, and a modern cabin draws attention. The standards of build, and fit and finish, are among the best found on a truck. Comparable with that of a luxury car, the cabin has an interior height of 1570 mm. Ergonomically well-engineered, it does not take long to arrive at a comfortable driving position. The suspended seat offers high degree of adjust-ability. The steering is adjustable for reach and rake. The I-Shift lever is besides the driver seat, and within easy reach. In the ‘Auto’ mode, the truck smoothly moves away from stand still. Not much noise or vibrations filter into the cabin. With small increments in speed, the transmission seamlessly shifts ups, indicating a travel through the cogs on the digital readout of the instrument console. The high seating position (though not as high as the FH) provides a good view of the outside. The mirrors help too. The Volvo dynamic steering aids manoeuvrability, and the I-Shift makes easy work of driving the truck. The dynamic steering and the I-Shift reflect upon the technological prowess of the truck, indicating at once the attention that has gone into engineering the truck. Providing car-like driving environment, the FM 420 puts strong impetus on safety, reliability and productivity. If the suspended seat and the four-point suspended cab compensate for the suspension’s ability to absorb the road shocks, the parabolic S-shaped leaf spring suspension at front and conventional multi-leaf spring heavy-duty bogie suspension at the rear, is configured for duties a car cannot even dream of. Surprisingly, the ride is not as harsh as one would expects. Comfortable enough to not let the driver tire quickly, the FM 420 makes for a premium driving experience indeed. A mere touch of the pedal activates the disc brakes. The action is progressive and highly effective. Impressive in the way it dials comfort, the Volvo FM 420 impresses.